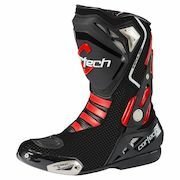 The Cortech Impulse Air Road Race Boots are the boots you reach for when the weather heats up and the road beckons. The inner lacing system has drawstring adjustability, keeping your foot snug. The vented upper and Air-Mesh lining help to keep your feet cool and dry. An adjustable hook and loop flap covers the locking zipper. Ride longer and harder with the Cortech Impulse Air RR Boots.